4Story explores a fantasy world where three warring factions inhabitant the game world. Focusing on quests and the PvP between these factions 4Story has crafted out a niche with the MMORPG genre that has served the game well since its 2009 launch. Often compared to the giants in this genre (such as World of Warcraft and games like it) 4Story offers a very typical game setting and general flow to gameplay. The fantasy world is exactly what you would expect to see in a modern day MMORPG although you’ll be pleasantly surprised at the sheer number of quests the game throws at you. This ensures no grinding is really ever necessary as you’ll simply jump from quest to quest and area to area. Set in the world of Iveria you’ll be thrust into a world of chaos as the kingdoms of Craxion, Broa and DeFugel fight over the vast game lands. Character creation offers three races (Fairie, Werebeast, Human) that can help you enhance your class choice. Fairies for example make masterful wizards thanks to their high natural intelligence while Werebeasts are impressive fighters due to high vitality. Other classes on offer in 4Story also includes archer, summoner, priest and assassin which have fairly typical roles in group play but do all come with unique and flashy skills. While there might not be any particular innovation here the mixture of race and class design offers more than enough depth. Everything else that you would expect to see in a good MMORPG is also available in 4Story. From solid PvP opportunities, great soundtrack and plenty of instanced dungeons for you and your friends to hunt for the ultimate gear. 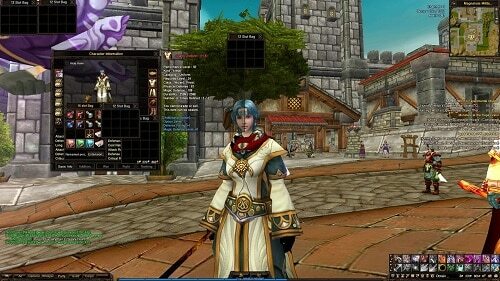 For fantasy MMORPG action 4Story ticks many of the boxes that MMO addicts crave in an experience. There are some rough edges but when compared to other options 4Story is definitely worth a look. 3 different factions warring across the fantasy game world. Combine 3 races with several class options to customise your character growth. Countless quests ensure you never run out of options. Plenty of PvP with even Realm vs Realm available. Millions of players create a huge and friendly community.